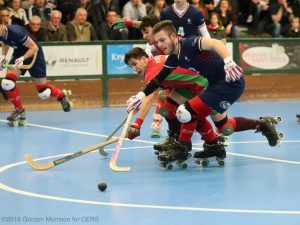 A great number of goals and emotions on the first day of the Latin Cup in Saint-Omer. The U23 National Team of France, Portugal, Italy and Spain confirmed their very high level and offered to the hundreds of fan of the “Salle du Brockus” more than three hours of wonderful rink hockey. In the opening game, Spain conquered its first overwhelming victory clearly defeating Italy. The team of Alejandro Dominguez scored twice in the first moments of the game, well opposing to Italy’s counterattacks. The team of Massimo Mariotti, after a very bad beginning, had some opportunities, but its forwarder found an impassable obstacle in the Spanish goalkeeper Blai Roca that even saved four direct shots. In the last part of the game, Spain increased its goals taking advantage of the counterattack offered by Italy. The big surprised of the day arrived a couple of hours later when France won the game against Portugal, the defending champion. This was a really tough game with goals, fouls, suspensions and, most of all, a wide variety of emotions. Carlo Di Benedetto, with its triple, signed the match for France. Even if the home team was never good at closing the game (failing some favorable occasions in the last minutes), France reached the end of the game ahead in the result. With less than 5 seconds still to play, the team of Fabien Savreux committed its 15th fouls, giving Portugal the opportunity to tie the game. The last hero of France was Kevin Correia that made a historical save on Alvaro Morais and closed the game. Tonight, the second day of the Latin Cup is scheduled. Italy and Portugal are looking for victories to remain in the run for the Cup, but Spain and France seem to have a lot to spend on this competition. Spain and France 3, Portugal and Italy 0.